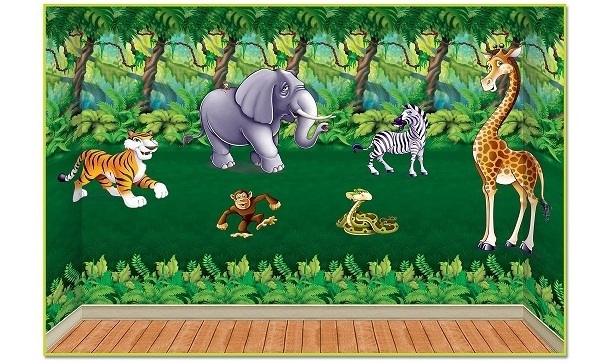 Make your party room a jungle! Decorate for a Jungle theme birthday party, a jungle baby shower, or use them as part of your vacation Bible School program. We have everything you need to turn your wall into the deep, dark jungle. Celebrate a jungle birthday party or event without having a monkey on your back! Our jungle creatures are fun and friendly additions to the scene. The backdrops are 30 feet wide, can be trimmed fit your space, and are easy to hang with tape, push-pins or double sided adhesive tabs.